Jacqui Schulz was the Frinj Director in 2005, this year also marked the beginning of the Frinj posters designed by Kate Finnerty. “There were elephants and acrobats and a clown on a bicycle”. 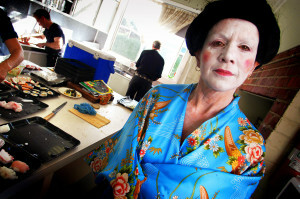 Mary French had a film of the elephant arriving on a train and being unloaded first to help with setting up the tents. And in 2005 the circus came back. With elephants and acrobats and bicycles and a clown. Could you believe your eyes when a juggler juggled 45 balls, a chair and an elephant? And is it really possible for the human cannon ball to survive after being shot head first into the silo? The Cirque de Silo project included Jillian Pearce, Anna Loewendahl, Dave Jones, Erik Pootjes, Greg Pritchard, Mary French, Marko Respondeck, David Franzke and Santha Press. And a couple of others, maybe about 140. This was the team that presented Space and Place in 2003 and again in 2004. 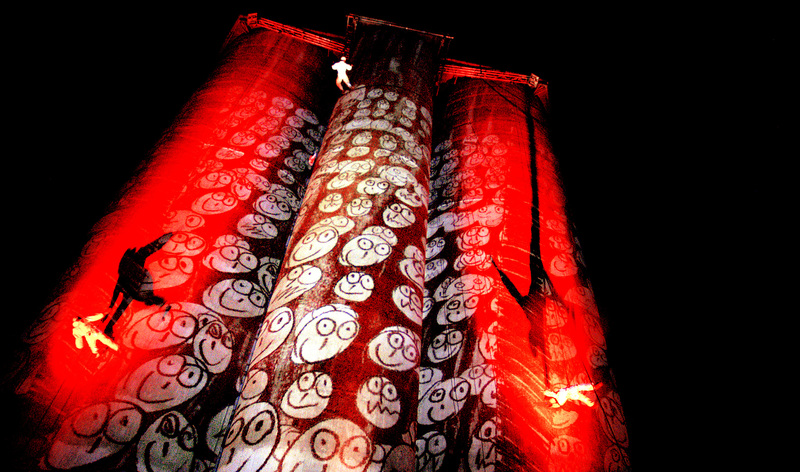 Amazing interactive computer projections, aerial performance, animations and local children’s shadow puppetry on the 30m canvas of the town’s wheat silo, combining reminiscences from older community members and a mass community choir. 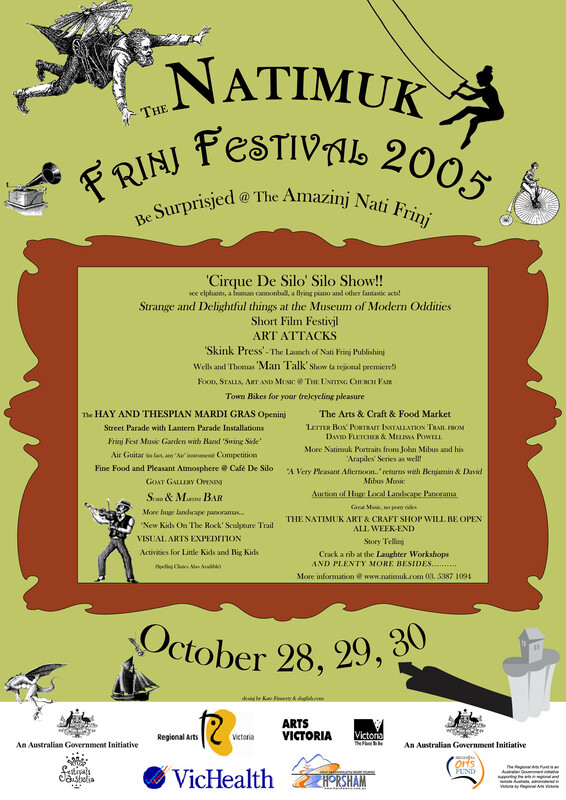 In 2005 the silo show was again the feature performance of the Nati Frinj (by now settled down to it’s J spelling to differentiate from other Fringe festivals). It rained buckets during the show but the audience stayed, transfixed by what they were seeing. 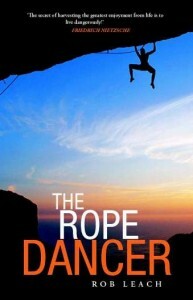 When the lights came up and the credits began to roll there was water streaming off the ropes and aerialists. Cirque De Silo from ACT natimuk on Vimeo. 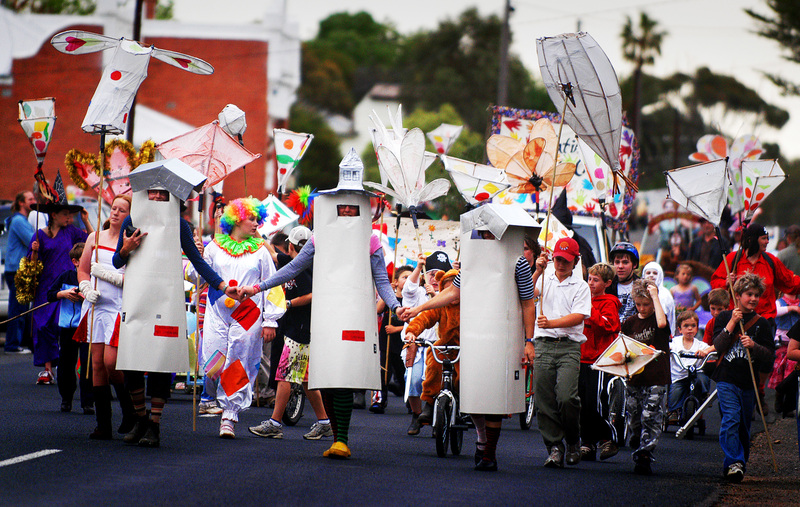 The community celebration was the friday night Hay and Thespian Mardigras, again very popular with many strange costumes. It finished with a party in the council car park. The town was also graced with Edwin’s Irvine’s free Town Bikes, artistic rebuilt bikes that were available to ride from event to event. There was a very successful show in the Goat Gallery and also a number of art exhibitions scattered around town, a series of photos by Melissa Powel and David Fletcher and Greg Pritchard’s “The Frame” located just down the road towards the mount. There was a very successful show in the Goat Gallery. Anthony Pelchen exhibited in the Lutheran Church, Peter Hill in the National Hotel, and Ewen Ross in the Lutheran Hall. There was the Dunny Trail, an art trail taking in the backyard dunnies of the town. And a sculpture exhibition in the Anglican hall. 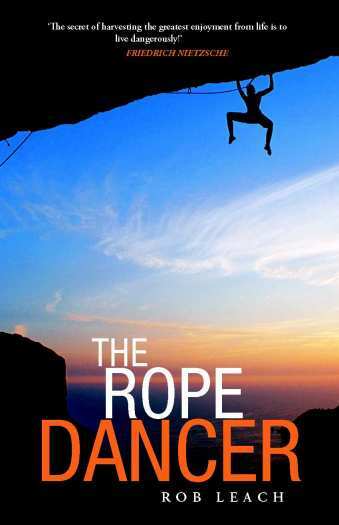 It was also the year that Skink Press, the publishing arm of the Frinj was launched with the release of Dr Rob Lynch’s The Rope Dancer. Although the Frinj had dabbled with after parties in 2005 they employed Melbourne’s Adult Youth to run a dance party. It went off. It has ushered in a trend for Frinj’s to have a dance party or some over the weekend.